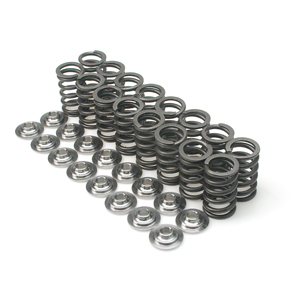 Designed for high rpm, BC valve springs are wound from only the highest grade, super clean, chrome silicone alloy and feature proprietary processing procedures for consistent pressures. 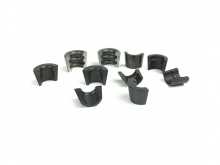 BC retainers and spring seats are CNC machined from 6AL4V titanium to exacting tolerances. Needed new springs/retainers for my 2002 EP3 which is still rocking it's original K20A3 that has nearly 170k miles on it. One factory retainer let go after nearly 13 years of abuse. I'm sure the Hondata flash redline bump didn't help the situation any :D It literally split in half and looked like it was cut down the center with a razor blade. Four other retainers were cracking in a similar fashion but hadn't broken yet. The good thing is that I don't have to worry about this happening anymore. My mechanic, who is an Acura Master Technician, was a little worried initially about some valvetrain noise due to the, considerably, stiffer springs. However, after the initial and secondary valve lash adjustments it sounds completely stock and purrs like a kitten. He adjusted near OEM spec for the K20A3. I can't tell you exactly where he ended up. Valve adjustments simply requires the experience of doing it before and knowing what Honda motors like to run smoothly, quietly and optimally. The quality of this kit is hard, if not impossible, to beat for the price. 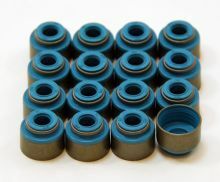 If you want the peace of mind of a durable top end, then look no further than this kit...and drive your Honda the way it was meant to be driven.